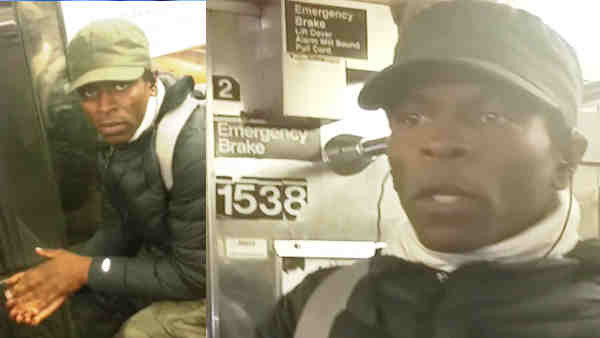 These are an NYPD-released photos of the suspect in the attack on a Brooklyn subway. NEW YORK (WABC) -- The NYPD says they have made an arrest in a subway slashing in Brooklyn. Police said 37-year-old Ras Alula Nagarit is facing several charges including 2nd degree assault, attempted 2nd degree assault, criminal possession of a weapon, and menacing. A woman was riding a southbound 3 subway between Atlantic Avenue and Eastern Parkway at around 9:30 p.m. Tuesday when a man told her, "I will chop you up on this train." He hit her hand with an object wrapped in a cloth, causing a minor nick, according to the new York City Police Department said. She was treated at the precinct. Police said it apparently was a random attack. Nagarit surrendered to police at the 25th Precinct in East Harlem, where he lives, just before 2 p.m. Thursday. He will be arraigned later Friday. The victim never actually saw what was inside the cloth during the Tuesday attack, but investigators said it could have been a machete or some kind of knife. Nagarit has an arrest record dating back in 1996. His first arrest was Sept. 30. 1996, charged with robbery, criminal possession of a weapon and menacing for robbing a person at gunpoint.